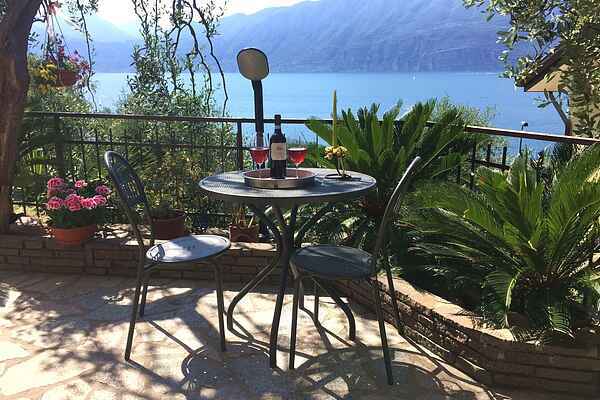 Lovely apartment about 100 m from Lake Garda and the center of Castelletto di Brenzone, in a hilly area accessible from an uphill road. Thanks to this location, the holiday home offers a beautiful lake view. All inside the same property is the owner's home. Carport covered. The house is reached by crossing a short and narrow gallery, the street is reserved for residents only. Guests will be escorted to the holiday home by the owner, passing by another road, so please contact him in advance. From Castelletto di Brenzone you reach the chain of Mount Baldo, via the cable car from Malcesine (10 km) or by car from San Zeno Di Montagna towards Prada for hiking and walks. In the area there are numerous villages, churches and capitals, not forgetting relaxation and fun, about 25 km away are the amusement parks of Gardaland and Movieland and the spas of Colà. The countries surrounding Lake Garda such as Riva del Garda, Bardolino, etc ... offer many gastronomic and shopping opportunities. Of great interest are the art cities: Verona, Brescia, Venice.